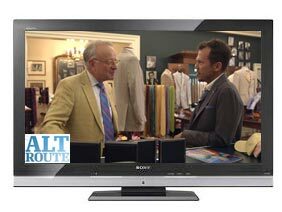 Matt Hranek of the new Esquire Network's Alternate Route visits Ben Silver and finds the perfect pair of monk strap shoes. Click to view the video. 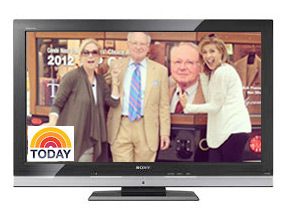 As seen on the Today Show...Kathie Lee and Hoda visit Ben Silver looking for the perfect Southern gentleman! Click to view the video. 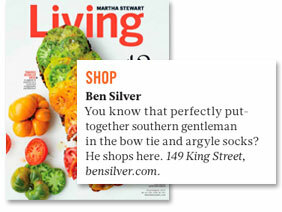 Martha Stewart Living names Ben Silver a Charleston "find" in their travel section. Click to read the article. 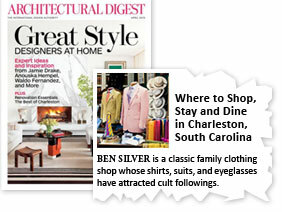 Architectural Digest lists Ben Silver as one of the places to visit in our beautiful home town of Charleston. Click to read the full article, or view a page from the original magazine. In the New York Times, the article "Fit to Be Bow-Tied, Ahead of Time" by David Colman quotes the Ben Silver website in regards to pre-tied bow ties. Click to view the article. Congratulations to our Mayor on his Election! 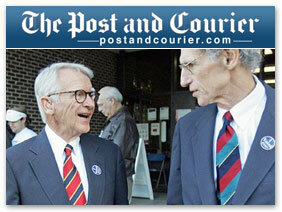 Mayor Joe Riley and campaign chairman Capers Barr are shown on election day wearing Ben Silver authentic British regimental striped neckties. Click to view the photo by Leroy Burnell. 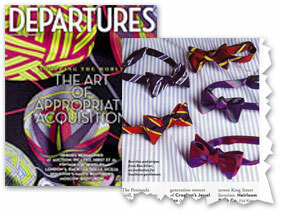 Departures features a photo of our authentic regimental bow ties in the article "Charleston: An Insider's Tour" by Andrew Sessa in the November/December 2011 issue. Click to view the article. 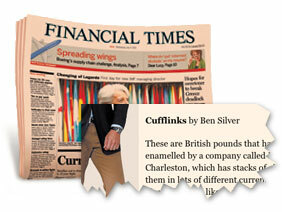 Our coin cufflinks are mentioned in "Power dressing: Rich Riley" in the Financial Times. Click to view the article. "Back to Ben Silver" by Cator Sparks was published on the Sundance Channel's website in the Full Frontal Fashion blog on January 7, 2010. Click here to view the article. 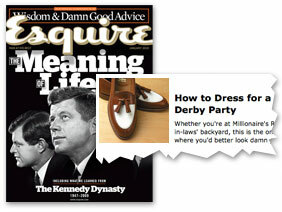 Our Summer Tassel Loafer, made exclusively for us by Alden, was featured in the Esquire online article "How to Dress for a Kentucky Derby Party." View the style guide online. 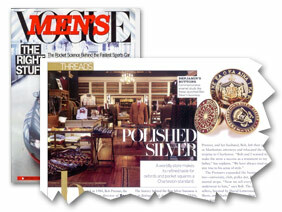 The Ben Silver shop was mentioned and photographed in Sherman’s Travel magazine article on Charleston. Download it here. "...But with the new assignment, he wasted no time in making his way to Ben Silver. As soon as he passed through their door, one of the soigne shop girls took charge of him. In the space of ten minutes she picked out a crisp white shirt, a black silk knit tie, and grey suit. Then she pulled a linen handkerchief from a display, folding it into the jacket pocket until just a thin white strip showed. 'Like Cary Grant in North by Northwest,' she said. 'Perfect.'..." 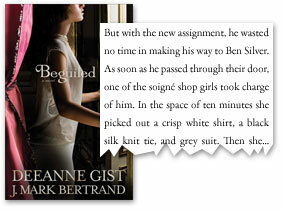 An excerpt from the Mystery/Romance novel Beguiled by Deeanne Gist and J. Mark Bertrand, available from the publisher. 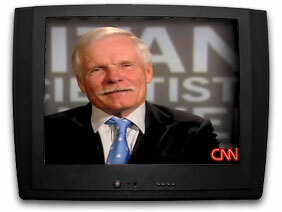 Ted Turner wore our White Dove necktie on the AC360 special of the 2009 Time 100. 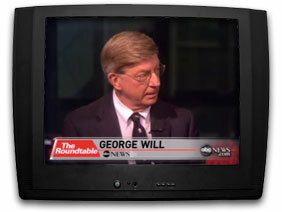 George Will discussed his necktie with George Stephanopoulos on ABC's The Roundtable May 3, 2009. WILL: You may be admiring my necktie. STEPHANOPOULOS: I love your tie. STEPHANOPOULOS: Tell me what it's about. WILL: The silhouette of James Madison. This is the tie of the Federalist Society. Ben Silver makes this tie exclusively for the Federalist Society as part of our Custom Collection. 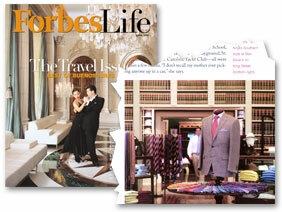 Ben Silver is featured in the April 2009 ForbesLife article "Past Perfect: Charleston's Glory Days are Now" by Richard Nalley. 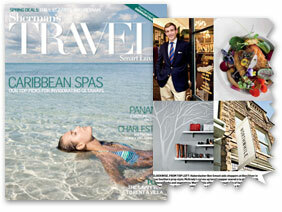 Click here to read the article or view a page from the original magazine. 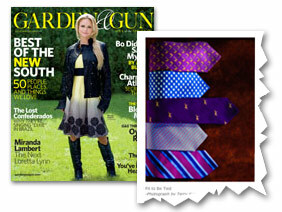 Ben Silver's woven wool pointer tie is shown in the Garden & Gun's August 2008 issue. Part of the "It's All in the Details" feature, our tie is center in the photograph by Terry Kuzniar of "Fall Neckwear with a decidedly Southern connection." Entertainment Weekly joins the ranks of recent showcases of The Ben Silver Corporation's classic striped neckwear. 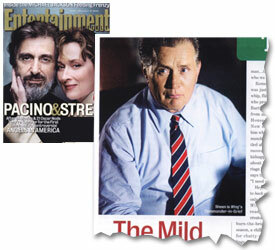 Page 81 of Issue #740 (December 5th, 2003) features actor Mr. Martin Sheen wearing one of Ben Silver's famous striped ties. Well-known for its large selection of university, club, and regimental striped ties, Ben Silver has been clothing actors of television and film for years. Sheen joins the ranks of Russell Crowe, David Letterman, and Harvey Keitel in wearing these classic, easy-to-wear ties.